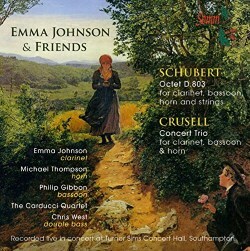 It was a clarinettist, Count Ferdinand Troyer, who commissioned Schubert to write his Octet so it’s fitting that this live performance should be billed as one by “Emma Johnson and Friends”. As Robert Matthew-Walker points out in his excellent notes Schubert was surely influenced by Beethoven’s Septet, Op 20 and, indeed, Troyer seems to have envisaged Schubert’s work as a companion piece to the Beethoven, which had been published in 1802. The scoring of the two works is very similar – though Beethoven specifies only one violin – and both are cast in six movements. Furthermore, the nature of the individual movements of the respective works, and their placing within the respective scores, bear several similarities so the structure of Schubert’s work bears quite a resemblance to Beethoven’s design. These performances were recorded live at a concert in the Turner Sims Concert Hall, Southampton. The playing is excellent and, even more importantly, the performances are imbued with a spirit which I doubt could have been captured as effectively in a studio. The Octet gets off to a most encouraging start with the slow introduction beautifully shaped. This gives way to a cheerful and energetic account of the Allegro. All the musicians offer dexterous playing, with especially noteworthy contributions from the first violin, clarinet, horn and bassoon. Schubert gives particular prominence to the three non-stringed instruments and all three musicians here relish their moments in the sun. The performance as a whole is full of good spirits. These high standards are maintained throughout the rest of the score. I admired the way the long, easeful phrases are delivered in the Adagio; here the mellow clarinet is well in evidence - and how effectively Schubert uses its timbre. Matthew Denton, the first violinist, also weighs in with many delightful touches. The third movement bounces along infectiously while Emma Johnson and her colleagues are consistently stylish in the way they play the variations in the fourth movement. The Menuetto is thoroughly genial. After a suspenseful introduction to the finale the body of that movement is rhythmically alert and full of bonhomie. With players of this calibre one rather takes technical excellence as read and such excellence is most certainly in evidence here. But just as evident is the sense of enjoyment that pervades the performance. These days it’s not unusual to find groups of musicians playing under the title “X and Friends”. Sometimes one might wonder if that’s just a marketing tag but I’m sure it’s not the case here. There’s a strong feeling of a group of like-minded musicians revelling in playing life-enhancing for pleasure and as a team. I enjoyed this expert and always smiling performance very much indeed and it’s evident from the vociferous applause at the end that the Southampton audience enjoyed it just as much. The short filler is a work by the Swedish/Finnish clarinettist and composer, Bernhard Crusell. Emma Johnson has already recorded all three of his clarinet concertos (review); this is a work of much more modest dimensions. Cast in four short movements which play almost without a break, it’s a ten-minute charmer. Robert Matthew-Walker says that the music seems “to breathe the clean open air of Scandinavia, positive and outward-looking.” Crusell writes with great understanding for the three instruments; each of them is prominent at various times but I also like very much the way they so often intermingle effortlessly, especially in the second movement. In the third and fourth movements, which dovetail together seamlessly, there’s an altogether winning interplay between the three instrumental voices. Emma Johnson, Philip Gibbon and Michael Thompson give a most attractive performance. The recorded sound is very good. Though there’s applause after each work the audience is otherwise completely unobtrusive. Robert Matthew-Walker’s notes are both useful and highly readable. With an hour and a quarter of delightful music in first rate performances this disc is a winner.